Over the years much has been said about the 13 Galgo puppies and their wonderful mom, Love/Stella renamed by her adopters, Mary Lou and Jack. We somehow omitted to tell you about Paco—the dad that was so much smaller in size than most of his full grown puppies. We just received this lovely note from Hannah Edelmann about Paco and thought we would pass it along to everyone that knew their story. 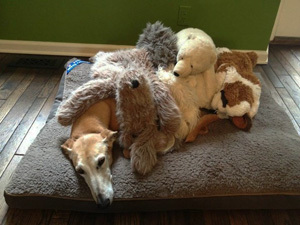 Thank you very much for the warm story about the Galgo pups. I wanted to add a little information about the Dad—you had named him Whiskers and we named him Paco—he was also at the reunion with his owner Hannah Edelmann—my daughter. She is actually on the reunion picture in the center. Our Paco was a great dog and lived with us for nearly 10 years. We put him to sleep about 2 years ago after a Osteosarcoma was diagnosed (he limped) and we could not manage his pain any more. He still has a place in the heart of the Edelmann family. As an introduction my name is Hannah Edelmann and I was the little girl in the middle of the picture in the family who owned Paco (he originally was named Whiskas when we adopted him in 2004 ) but he was the father of all the little puppies. I remember that reunion day perfectly. I was so excited to see all of the dogs related to Paco. When we found out that Love had puppies, I tried to get my parents to adopt one but it never happened. Paco was the love of my life (and really my dog if you ask anyone in my family). Unfortunately, we had to put him down two years ago (Oct 4, 2013) because he was diagnosed with bone cancer in his back legs. This decision was made when he was in too much pain and the medicine he was receiving stopped working. 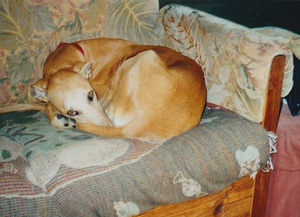 But he was the most amazing dog one could ever wish for. I have more happy and lovely memories of that dog than anything else. After seeing that article, I just wanted to let NGAP know that Paco lived a happy and joyous life surrounded by many people who loved him. I was sad to read that all of the Love/Paco puppies had passed except one, but glad that the Paco gene is still out there! 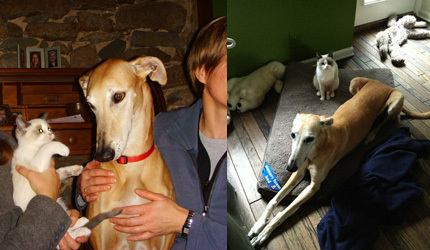 I am just waiting until I move to more of a permanent residence and then I will be back to adopting greyhounds. 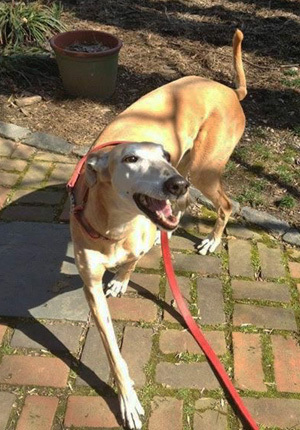 Whenever I am in Philly though, I always come and walk the dogs, so that my life always has a bit of greyhound in it!